MagicPlot Batch Processing allows to automatically process multiple similar data in the same way without programming (scripting) and recording of macro. One only have to ordinarily process the first data set manually and then use it as a template for processing of the rest data sets. Batch Processing includes the processing of data itself and semiautomatic fitting of the series of similar data. Batch Processing idea is based on creating a copy of project components (Tables, Figures, Fit Plots) with formula links between them, pasting new data into the copy of source Table and recalculation of depending data using formulas. 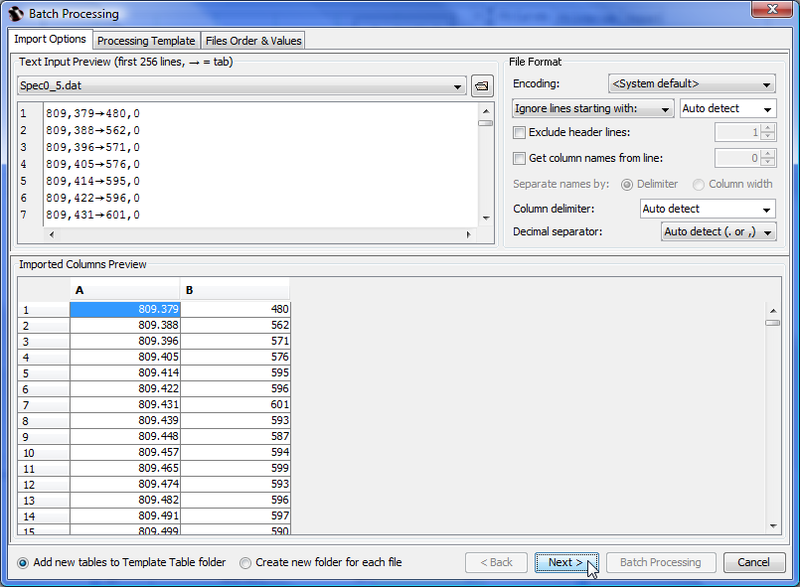 The Table which contains the imported data from the first manually processed data set is called Template Table. Recalculate all depending data in copies. Fitting of series dialog will be opened after batch processing. This tool allows you to fit multiple data with the same model. It is supposed that you have a number of text (ASCII) files with similarly formatted source data to be processed. Import the first text file from series (Project → Import Text Table… menu item) and process it. You can add new columns with formulas, calculate some derivative data (histograms, FFT, etc. ), create Figures and Fit Plots. There is one simple restriction: Do not change the sequence of leftmost columns with imported source data: do not insert columns left, delete and move these columns. 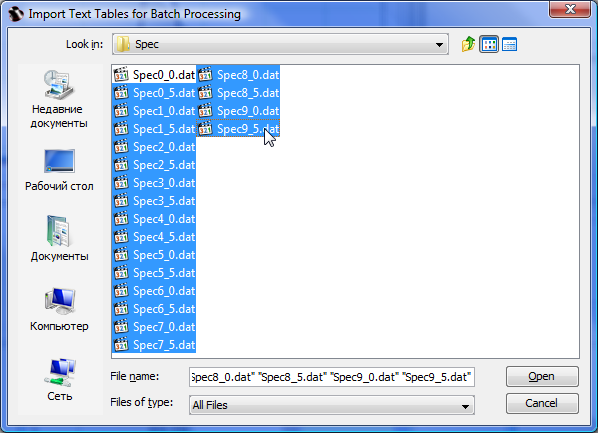 Table sorting and transposing is also not supported in Batch Processing. Create Fit Plot(s) and fit your data if you want to fit series. Run Batch Processing by selecting Project → Import with Batch Processing… menu item. In the opened file dialog select all rest files in the series except the first file which has been already processed. Use Shift and Ctrl to select multiple files. Import Options: Check the file format settings. Processing Template: Specify the Table with data from the first file (already processed) as Template Table. The program will automatically show the derivative components with related data. You can also deselect some components to prevent cloning. Files Order & Values: Set up the file names parsing to get some values to include into summary table. Select the files sorting. Note that the already processed file will always be the first. Click Batch Processing button to start processing. MagicPlot will create a copies of Template Table and all derivative components and paste new data in the leftmost columns. 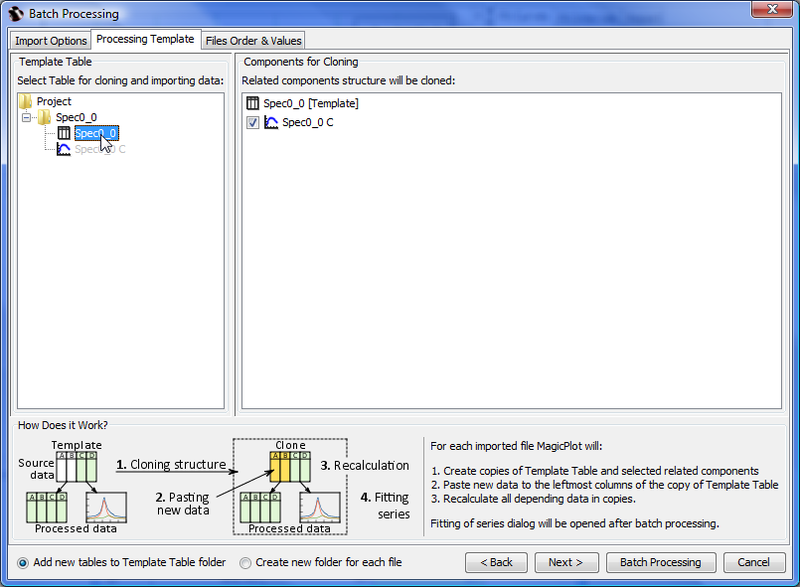 The Fitting Series dialog will be opened if some Fit Plots were processed. 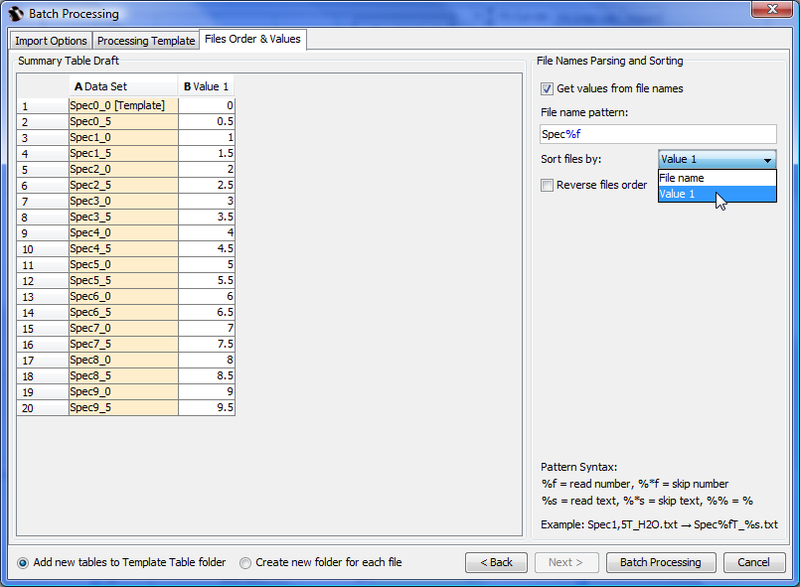 The Fitting Series dialog will be opened after the batch processing finishes if some Fit Plots were created during the processing. If more than one Fit Plot was created for Template (and for each data set also), multiple tabs with Fit Plots will be shown in the window. Each tab will show one Fitting Series. The fit curves will be copied from the template plot (first in list) or from the (already fitted) previous plot depending on radio button selected (see more information below). The baseline will be fitted with curve (selected in drop box) and subtracted from the experimental data. The data will be fitted with selected curve or sum curve (selected in drop box). Curves and Initial Values of Parameters: from the Template or from Previous Fit Plot? Select Previous if your data in data set changes 'evolutionary': the values of parameters (ex. peak positions) are changed progressively from one plot to another. This variant appears when you examine the dependency of your data on some parameter. Example: you heat the sample step by step and measure the spectrum; the temperature rises from one spectrum to another and peaks are moved. Each plot is more similar to the previous one then to the first one (the template). Select Template if all of your data sets are independent and no 'evolution' process can be seen between plots. Each plot is more similar to the first one (the template) then to the previous one. 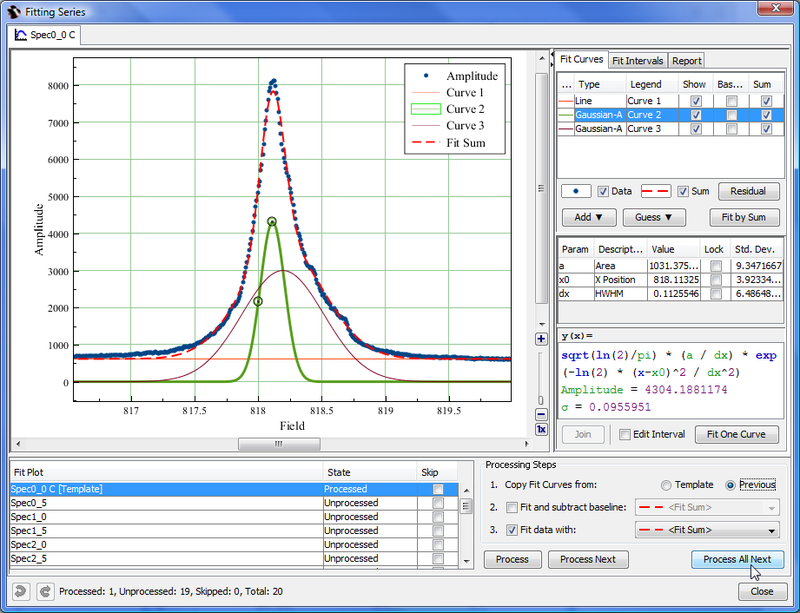 Process – processes the currently selected Fit Plot: The curves are copied from the previous or the first Fit Plot and fitting is performed. All existing curves will be removed from current Fit Plot before coping curves from previous/first Fit Plot. Process Next – opens and processes the next Fit Plot. Process All Next – automatically processes all the Fit Plots next to the currently selected Fit Plot. This option is equal to the manually pressing Process Next button until all Fit Plots will be processed. When using step-by-step batch processing (Process / Process Next buttons) you can change the fit for the currently selected plot. You can change the initial values of the parameters (move peaks manually), add or remove peaks. Don't forget to launch the fitting after the manual changing of the curve list or the parameters values. Summary Table will be created after finishing fitting series. This table contains the values of all fit parameters and standard errors for all processed data sets. You can use this data to create a Figure or Fit Plot or export it. By default the values in Summary Table will be updated if the values of fit parameters on Fit Plots changes. You can open Fit Series dialog using Fit Series Summary → Open Fitting Series Dialog… in summary table.